First wash Hilshafish chunks thoroughly and rub half of the Turmeric Powder and ½ tsp. of Salt and leave fish chunks for 10 minutes. Then a big bowl take Plain Curd and using a spoon beat the curd until smooth. And add Mustard Oil, Salt, Sugar and rest of the Turmeric Powder to the Curd and mix vigorously. Add slit Green Chilies to the Curd mixture. Now place Hilsha Chunks in the curd mixture and coat from both sides. Then cover the bowl with a lid and leave it for 30 minutes with the curd marinade. Doi Ilish can be cooked either in flame or in microwave as well. Both the processes mentioned below. Then using Wok or Pan: Take a deep bottom Pan or Wok and pour Fish chunks along with the marinade in the pan and add around 2 Cup of water to the mixture. Cover the Pan with a lid and cook in medium flame for around 15 minutes. Flip fish pieces in halfway and cook till you get desire consistency of the gravy. 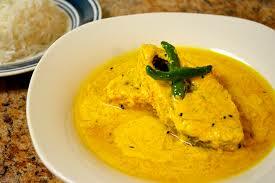 Finally serve this DOI ILISH any decorated plate or bowl.